The Moody Blues. One of the seminal bands of the twentieth century with hit after recognisable hit to their names. So when the main man casually walks out onto the stage of The New Brighton Floral Pavilion to introduce his special guest for the evening, Mike Dawes, the warmth and admiration for Justin Hayward without him even having to load up with a guitar is almost tangible. Mike Dawes, for those who don’t know his music, is a phenomenon. His mastery of the acoustic guitar is something extraordinary with barely a piece of it not plucked, picked, slapped or thumped to create a sound that’s quite sublime. Blimey, he even deliberately tunes it out and the instrument in his hands still sounds fantastic during The Old Room. A deliciously mellow tune, perfect for reflection and taking in the view of a sea rolling into kiss the beach, glass in hand. Dawes is clearly at home on then stage. His banter with the audience is laid back and disarming, his demeanour that of a man clearly in love with his craft. Dawes’ version of John Mayer’s sublime Slow Dancing in a Burning Room, with its controlled loop duet sections, closes the all too short set on a high and stands out as not only as the highlight of the performance but of the night as a whole. 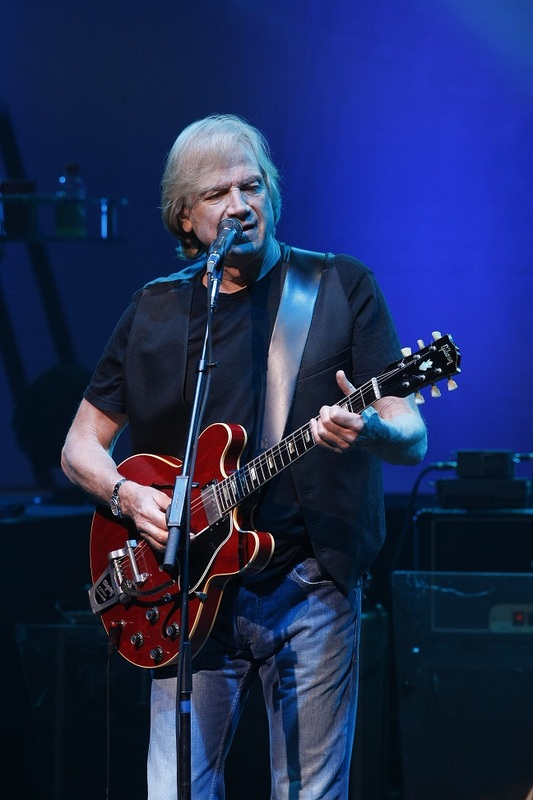 Justin Hayward may be 71 but the voice – that voice – remains as clear, sharp and emotion-fuelled as ever. Okay, the higher notes may be a little tougher to reach but nevertheless what lays ahead from the moment he breaks into Tuesday Afternoon (Long Afternoon), we know we are in the presence of a master. Backed by Dawes on guitars and the superb, long time cohort Julie Ragins on keyboards, harmonica and percussion, the sheers scale of sound the trio create is astonishing as the numbers and stories roll out. Lovely To See You is magical, Your Wildest Dreams is as close to perfect you could wish for and The Western Sky on any other set list would be the stand out of the night. Yet this is Justin Hayward, so those honours go to the big hitters. Forever Autumn is as timeless as ever, whereas Question, Blue Guitar and the closing I Know You’re Out There Somewhere, as superbly performed as they are, must bow in deference to the eternally majestic Nights In White Satin. Faultless, remarkable and memorable. Justin Hayward is an absolute joy to see perform and hopefully it won’t be long before the opportunity swings around again.